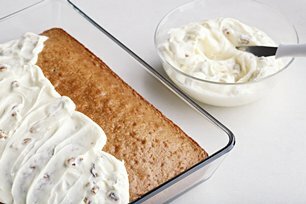 Plain cakes and cupcakes are transformed into special desserts when topped with this rich cream cheese frosting studded with toasted walnuts. Beat cream cheese and butter in large bowl with mixer until blended. This simple, yet delicious, recipe makes enough frosting to fill and frost 2 (8- or 9-inch) round cake layers; top and sides of 13x9-inch cake; or tops of 24 cupcakes.